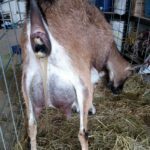 With three out of four does having kidded, and the fourth doe in the kidding pen now, it’s time to share a bit about this year’s kiddings! I’ll be posting more about goats soon: kidding, kids, milking, etc. Here I’ll recap Annie’s kidding experience. 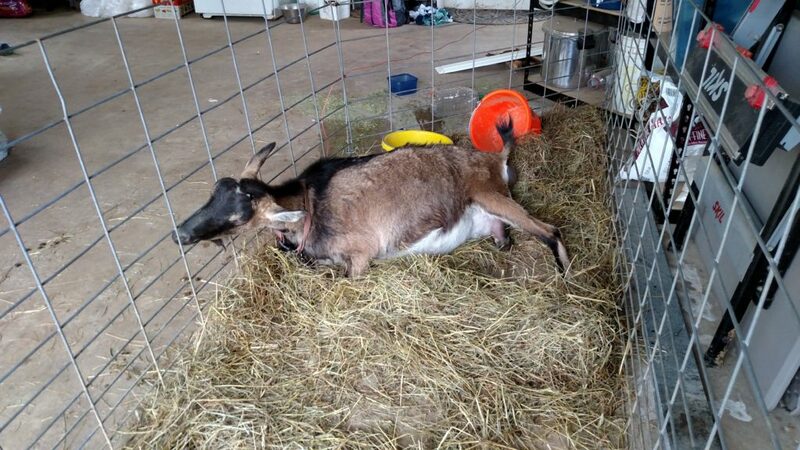 Annie was the second goat to kid. We had setup a kidding pen in our garage so it would be easy to monitor and assist with the kiddings. 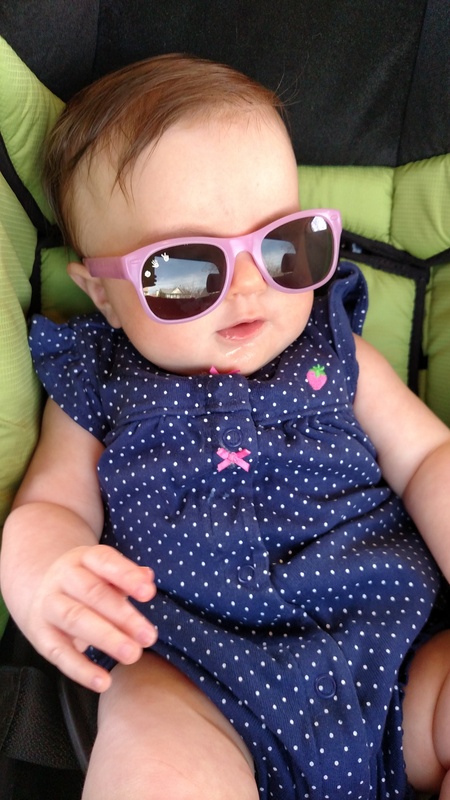 With a five month old baby, I didn’t want to sit out in the goat pen, waiting for a kidding to happen! The pen in the garage made everything a lot easier. Annie’s ligaments were loose one morning when I checked them at feeding time, so into the kidding pen she went! Rebecca says a kidding pen in the garage is where it’s at! Once Annie was in the kidding pen, she spent a lot of time trying to escape. 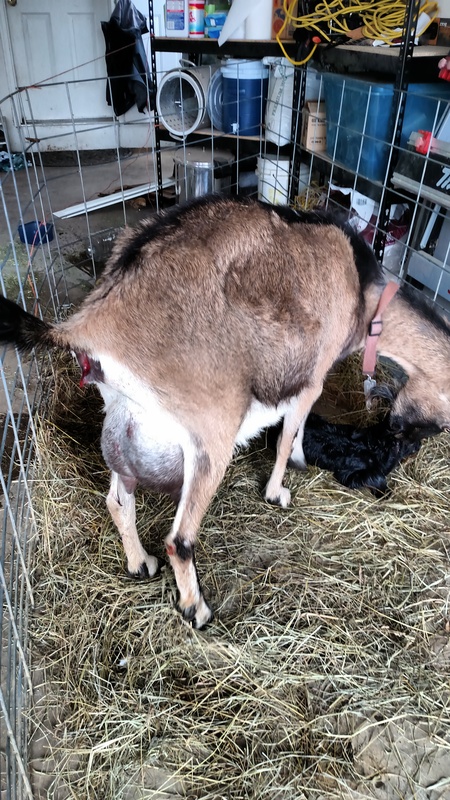 It was new, and she was in labor, so she acted like a goat. Finally, though, she resigned herself to being in the pen. 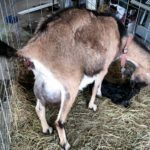 I think this occurred when hard labor started, and she had better things (like pushing out these goat kids) on her mind. She labored on the floor for a bit at first, but that didn’t last long. Then she got up, and stayed up for the rest of the labor. First two little goat hooves appeared. This was a good sign, since based on their orientation it was apparent these were the kid’s front legs. That’s the ideal way for kids to come: front legs and head first. Annie stayed at this stage for a while, with just the kid’s front feet visible. She didn’t seem in distress, though. She was just hanging out, with a kid’s front feet peeking out of her rear end. Finally, labor progressed! 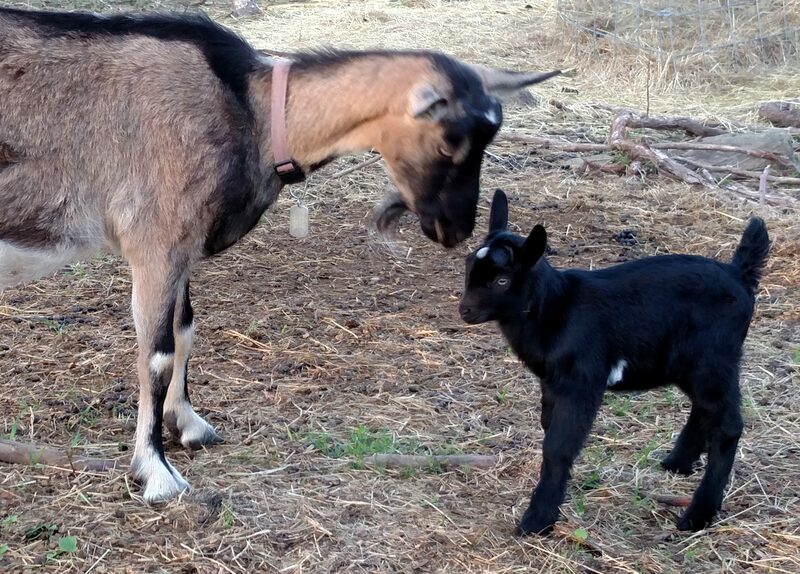 A healthy looking black goat kid was born, coming out in a matter of maybe a minute or two. Annie immediately began licking him clean, like a good mama. It was apparent he could breathe, so I didn’t intervene. My task while Annie cleaned up the kid was to determine if she had another in there still. I “bounced” Annie per the instructions from Fiasco Farm, and felt another kid in there. Bouncing was very easy, and having done it to Annie and other does without a second kid, it’s apparent whether there’s a kid in there or not. 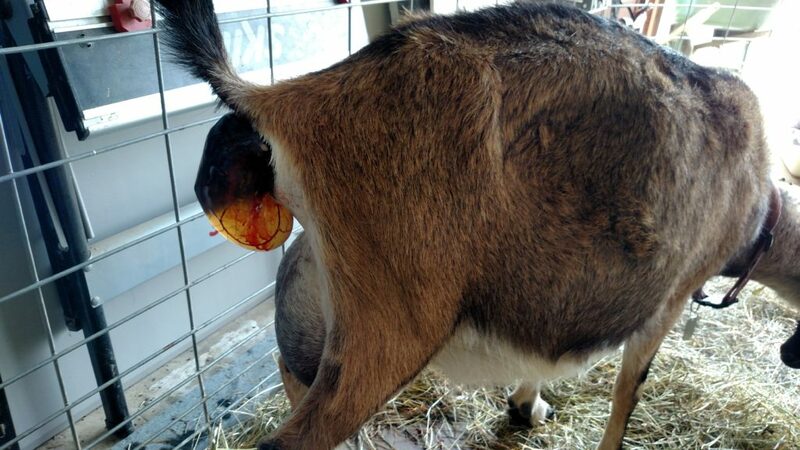 I waited for Annie to birth the second goat kid. The first kid was fine, laying on the ground and seeming to get its bearing in this world. After a short time, the second kid started to come out. You can see in the photo below it was coming out head first. While this is not the ideal position, as the front legs seemed to be back rather than forward, I had read that many goats can push out a kid in this position without needing intervention. So I thought I’d give her a minute and see what happened. That kid came out fast! I would be it helped that the kid was smaller than the first kid, and that it was the second one born. Annie did great during the kidding and taking care of her kids afterward. I left her and the kids in the kidding pen for the rest of the afternoon, so they could bond. Annie was given some extra grain, and some molasses in her water. She didn’t seem exhausted or worn out. I had to move Annie and the kids back out to pasture after just a few hours because another doe had loose ligaments, and needed to move to the kidding pen. Annie and the kids had bonded well, though, and moving them back out to the goat pen worked out fine. 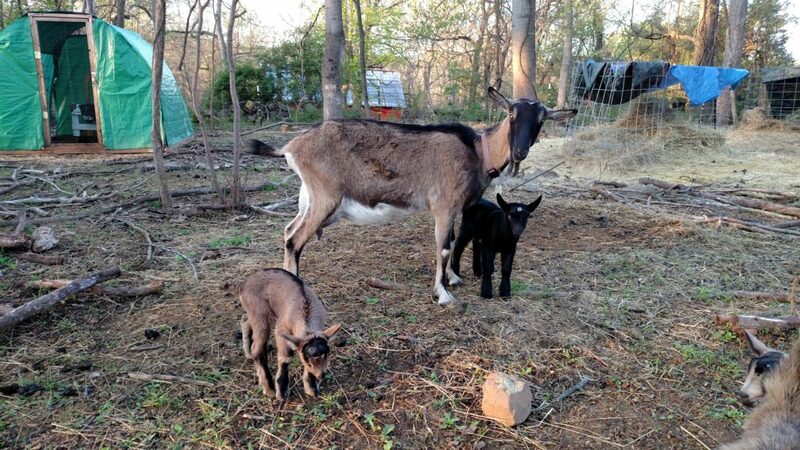 Here you can see Annie with her two bucklings. Annie’s firstborn, the black one, is named Storm and we will train him to be Rebecca’s cart goat. We are thankful that Annie’s kidding went well, and that we have two healthy bucklings. 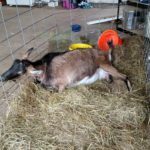 Stay tuned to read about the other kiddings, plus more goat fun!